In exploring the history of this building, I uncovered a tale of two families, one most fortunate, and the other less so. A different house on the lot at 31 South Main Street can be traced back to Isaac Fitts, a hatter, who petitioned for forty feet on the River bank in 1726, that he might set a dwelling thereon, which he accomplished in 1727. The house was purchased by Timothy Souther in 1794, and stayed in the Souther family until 1860. It was long known as the “Souther” house, and was taken down in 1917. In 1928, The Dr. Joseph Manning house, also built in 1727 just a few doors down the street, was moved to this location so that an automobile dealership could be constructed across from the Old Town Hall. In 1928, Richard W. Davis sold the lot to Millard J. Patterson with the condition that he could maintain the right to enter the building and conduct repairs until it was removed from the lot to its present location. In 1726, Dr. Joseph Manning built a fine early Georgian home on South Main Street opposite the intersection with Elm Street. The first of the Manning family to arrive in Ipswich were John, who arrived in 1634 and Thomas, who came two years later. All that I know of them is that they were swineherds, and played a prank on poor Mark Quilter, wreaking havoc on his small house by dropping a calf down the chimney. Nonetheless, the Manning family prospered and became distinguished leaders of the town and pioneers in medicine. The Ipswich High School once bore the family name, and a street still does. Joseph Manning was born in 1703 in Ipswich. He graduated at Harvard College in 1725 and returned to his native town where he served for more than 50 years as a physician, eminent and favorably known. Doctor Manning was the father of the legendary Dr. John Manning, whose home on North Main Street still stands. 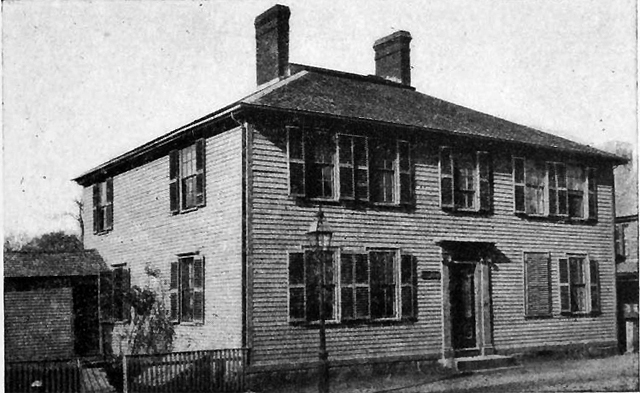 The Dr. Joseph Manning house on South Main Street, across from the Old Town Hall, in 1900, from the book Ipswich in the Massachusetts Bay Colony, Volume 1. 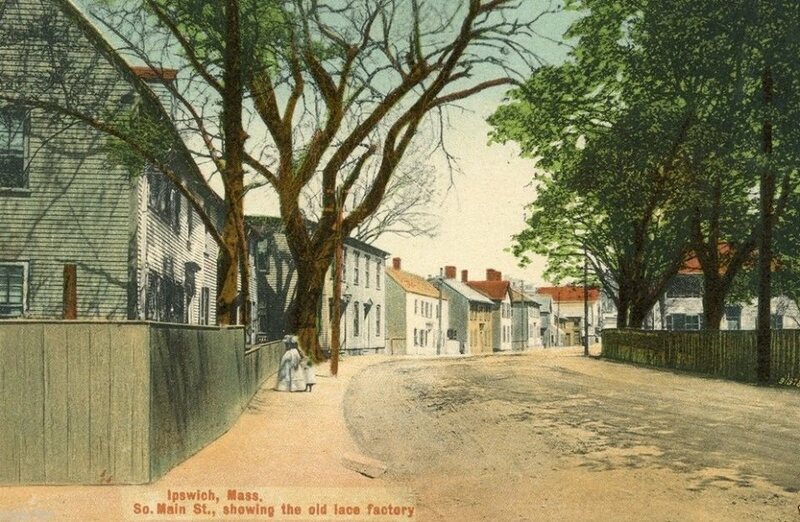 Dr. Joseph Manning and his wife are buried in the Old North Burial Ground in Ipswich. The old Timothy Souther house is the small one between the Clothing store on its left, (which is now Fiske & Freeman Antiques) ,and the building on its right, which burned after the Mothers Day Food of 2006. Thomas Franklin Waters wrote that the Timothy Souther house was torn down in the early 1900’s. I don’t know if Dr. Manning knew Timothy Souther, an unfortunate young man who arrived in town in 1763, unwelcome and unwanted. In the 18th Century, towns were responsible for the poor people within them, and measures were sometimes taken to relieve the town of responsibility for residents who were unable to provide for themselves. Timothy Souther arrived with his wife in 1763, and was “warned out.” The town’s lack of hospitality did not serve him well, and in the book Memento Mori, a grave at the Old North Burial Ground at location D-41 tells us his sad story: “Here lies the remains of Mr. Timothy Souther who departed this life August 5th, 1766, in the 27th year of his age.” His widow, Sarah Morton Souther was only 23 years old. She married widower Paul Little of Newbury on August 30, 1772, and died in Windham, Maine on September 26, 1797. Gravestone of the first Timothy Souther, who was “warned out” of Ipswich. Almost 40 years later in 1792, we read that another Timothy Souther, a native of Haverhill was also “warned out.” In the previous year he married Elizabeth Badger, daughter of Daniel Badger and Phoebe Lakeman, from an old Ipswich family. Timothy Souther was able to buy part of a small house near the Choate Bridge for his family, but things did not go well for him. A grave at the Old North Burial Ground for three-month-old Charles Souther, who died in 1799 shows his parents as Timothy Souther and Elizabeth Badger. 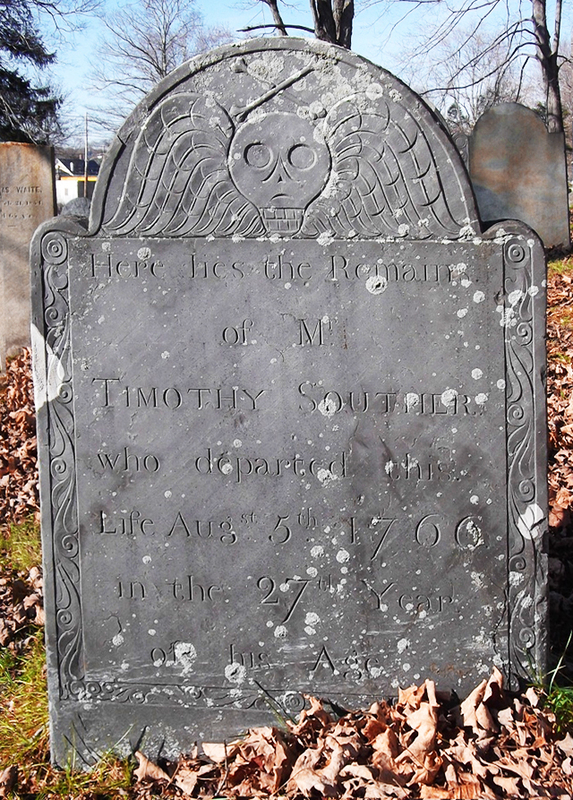 This Timothy Souter died in the West Indies at 36 years of age in 1804. By then he had sold “half of the half” he owned, but his wife Elizabeth Badger Souther continued living in the northwest corner of the house until her death on December 31, 1841 in Ipswich at age 74. Their son, also named Timothy Souther, was born in Ipswich on April 7, 1800. He appears to have done much better, and at one time owned a home on Meeting House Green where the Kaede Bed and Breakfast is today. He involved himself in the affairs of the town, and in 1829 this Timothy Souther became the collector of customs for the district and inspector of the revenue for the port of Ipswich at the old Custom House. He was caught up in a payback scandal, and in 1842 Souther moved with his family of five sons and two daughters to Alton, Illinois, where he served as the postmaster of that city from 1846 to 1854. 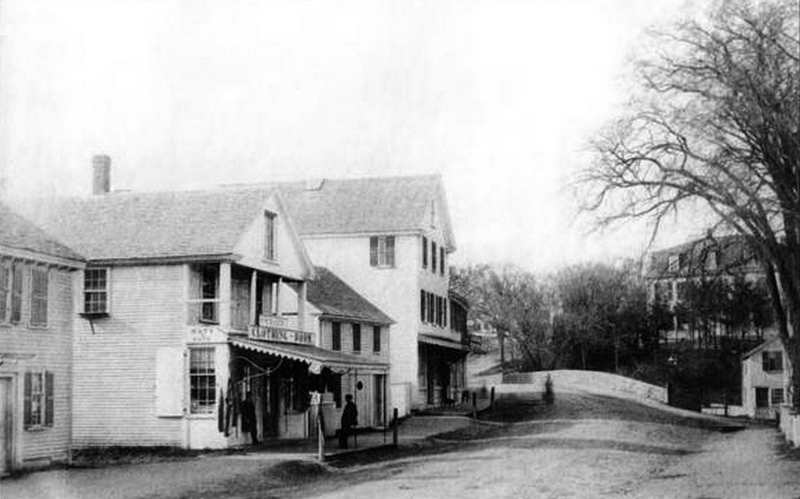 A view of South Main Street in the late 19th Century. Dr. Manning’s house is in the distance, and Timothy Souther’s house is too small to see, a couple of houses closer to town. The old Souther house near the bridge, or at least part of it, stayed in the family until 1860, and was always known as the Souther house. Thomas Franklin Waters stated that the Souther house was torn down shortly before 1917. 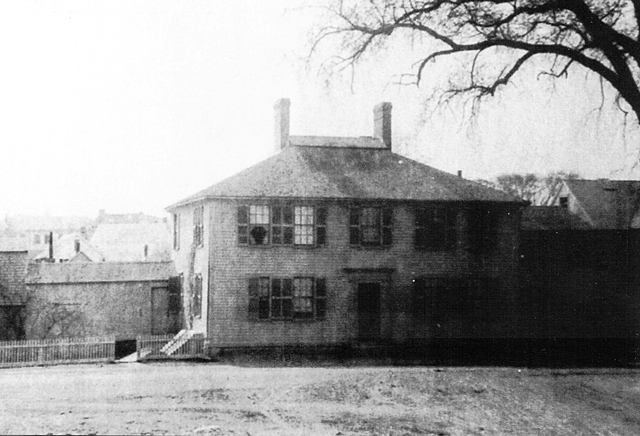 In 1928, the lot with Dr. Joseph Manning’s fine old home on it was sold by Richard W. Davis to Millard J. Patterson with the condition that Davis would still own the building and would have the right to maintain the foundation and eaves, enter the building and conduct repairs as long as the building remained on the lot (2814-20). By 1930 the house had been moved and a new automotive dealership had taken its place. That building now is home to AnnTiques. 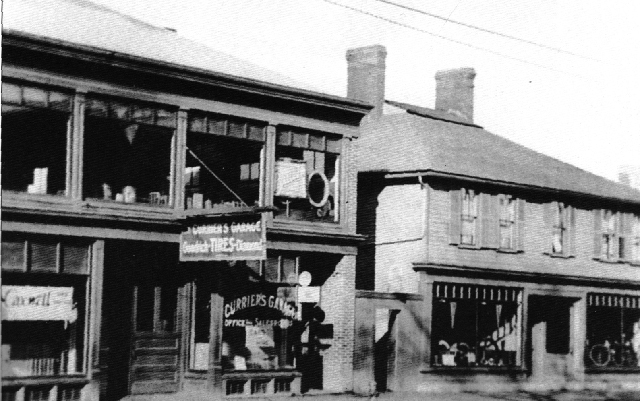 This is a photo of the Manning House on South Main Street, at about the beginning of the 20th Century. It was directly across from Elm Street. 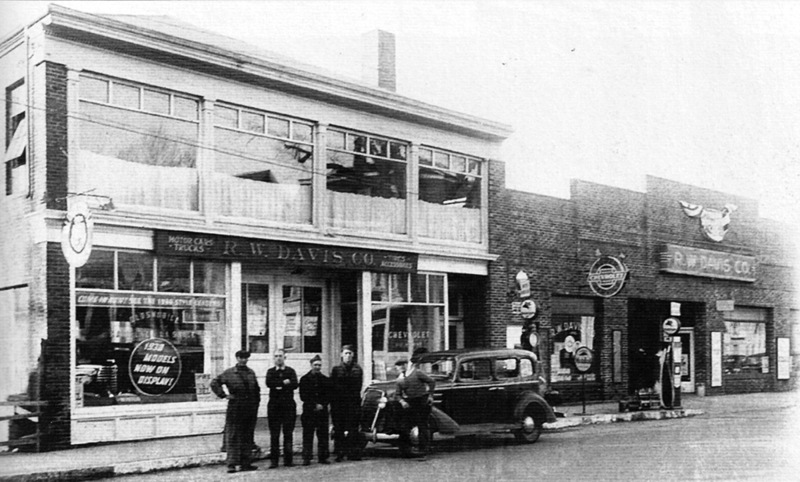 By this time it bore a close resemblance to the building that now stands at 31 South Main Street, being used as a bicycle store under the ownership of R. W. Davis. By 1930 the Thomas Manning house had been moved to the Timothy Souther lot, and R. W. Davis owned Courier’s Garage and built a brick building for his automobile dealership at the former location of the Manning House. 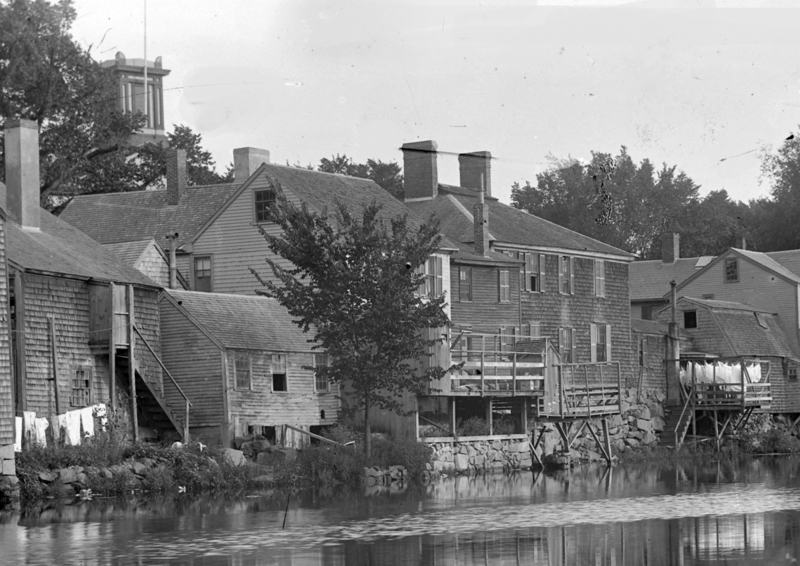 Rear of the Manning house, facing the Ipswich River, when it was across from the Old Town hall. Photo by George Dexter, circa 1900. 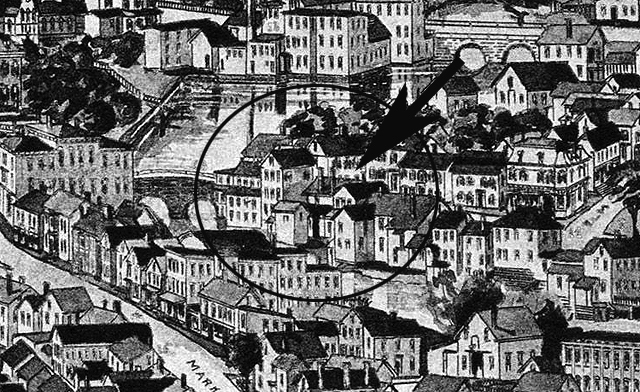 A closeup from the 1892 Birdseye Map of Ipswich shows the original Timothy Souther house, indicated by the arrow, and the Dr. Joseph Manning House at its original location a few doors down, across from the intersection with Elm Street.